Eximap’s solutions make it easier to keep your car in good shape. Simultaneously we help repair workshops and spare part dealers to provide the best possible customer experience. We accomplish all this via an innovative easy-to-use smart phone app. 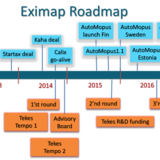 The current owners of Eximap have invested 60,000€ in the offering with the same terms as other investors. The investment guarantees that Tekes’ condition for a 161,000€ R&D loan is met. More details on Tekes’s decision e.g. loan terms can be found in the attached documents. Today marketing efforts are moving onto mobile devices - smartphones and tablets. We realized that the car aftersales market, i.e. car repair and spare part delivery, has not been following this megatrend yet. 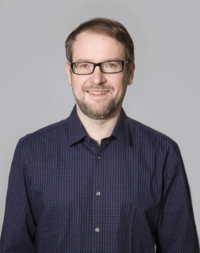 In general, the fundamental change in consumer behavior is clear, the consumers are increasingly searching the services they need on the internet, and predominantly with their mobile devices. 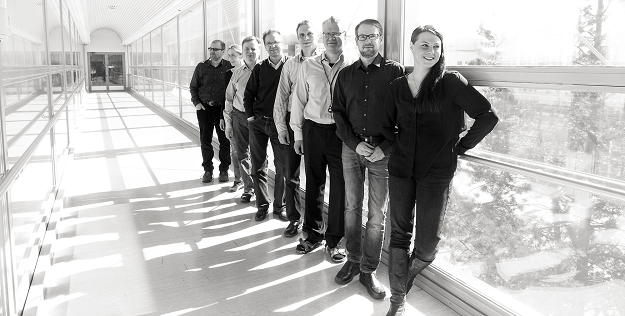 To gain insider information and deep understanding of the repair & spare part industry, we started development projects with our key customers including Kaha - the 2nd biggest spare part wholesaler in Finland. For the first results of Kaha co-operation, please visit the “Autolämpö” (car heating) campaign pages in www.autolampo.fi or in www.calixhaku.fi. 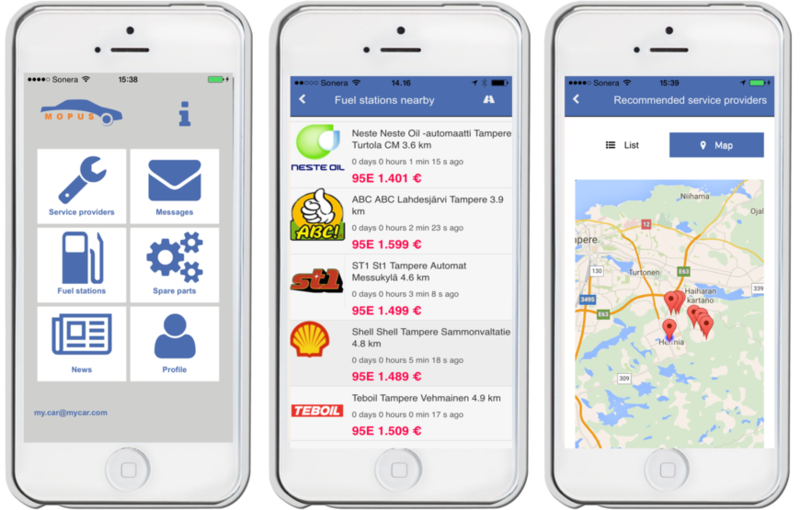 In addition to these web pages, the “Autolämpö” (car heating) smartphone application can be found for Apple, Android and Lumia phones. 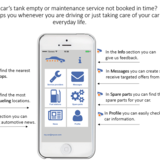 Eximap has developed AutoMopus, a mobile solution that revolutionizes the way people buy and take care of their cars. 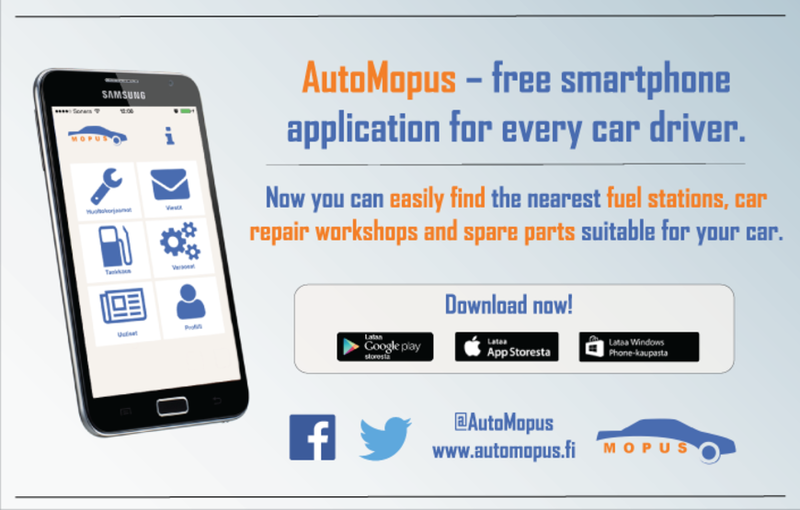 AutoMopus is an innovative cloud service and app that connects car owners, car repair shops and car spare part sellers. 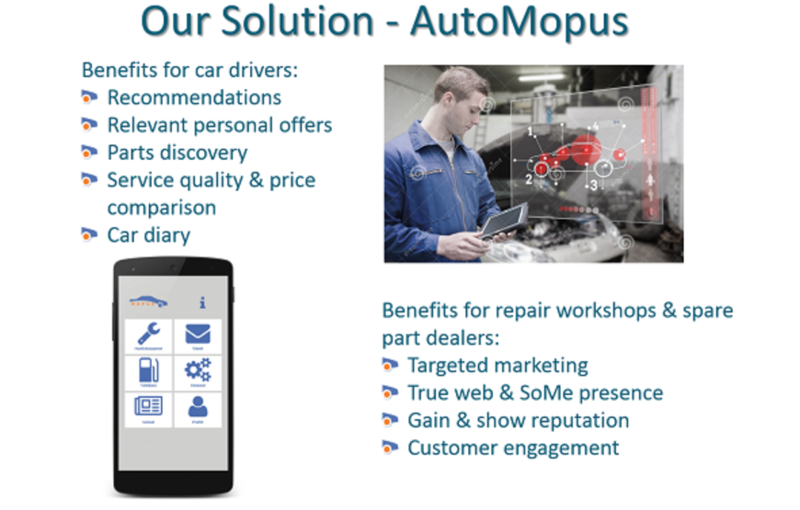 AutoMopus streamlines the process of selecting and booking car services for consumers and enables efficient targeted marketing and customer acquisition for car repair shops. AutoMopus is available today for Apple, Android and Lumia phones. 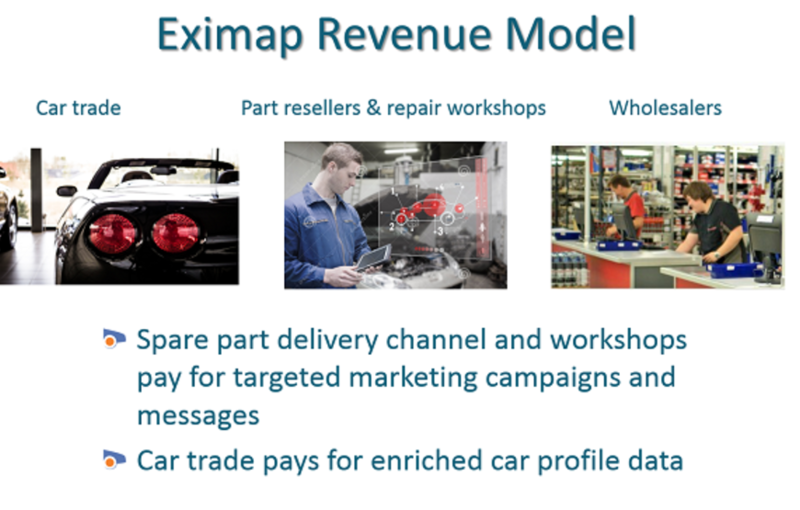 Eximap offers Software-as-a-Service (SaaS) solutions for both consumers and car aftersales markets i.e. car repair, car trade and spare part delivery industry. 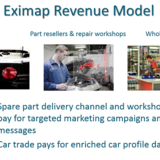 Eximap has developed AutoMopus, a cloud service and mobile application that connects car owners, car repair workshops and car spare part sellers. AutoMopus is a marketplace and communication channel for traditional car related services, for which a constant consumer demand already exists. In addition, Eximap delivers e-commerce solutions for spare part delivery channels. The challenge: For our users i.e. car drivers, finding the car service or repair shop that brings the best value for time and money is difficult and unreliable. Users cannot be sure of the price, quality of service work and fitting spare parts, as there is no simple transparent way to compare service providers and resellers. Car trading has long since moved to online marketplaces, but car services and parts are still advertised in printed magazines and catalogues. Fragmented information on car service providers can be found online, but phone calls or emails are needed to get price information or offers and to book an appointment. 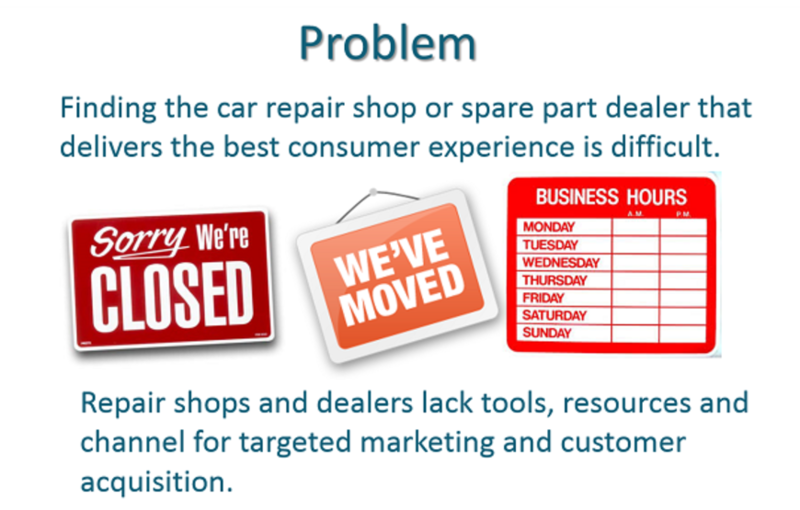 Repair workshops typically lack knowledge, tools, time and effective channels for online marketing and customer acquisition. This also means that services and repairs searched and booked offline are an untapped source of valuable data for advertisers and the car trade. Markets: As the challenge and our solution is global, our markets are global. Consumers (car drivers) are our end-users, and can install and use AutoMopus for free. Our paying customers include repair workshops, car dealers and spare part delivery channel actors as well as other car-specific service providers in the Nordic Countries, Baltics, UK, Germany and selected emerging markets. 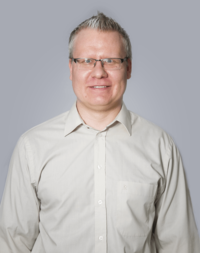 Eximap’s strategic partner Kaha belongs to the Swedish KGK concern, which operates in the following markets: Finland, Sweden, Norway and Baltics. This co-operation helps Eximap to go into these new markets. In Finland, the biggest spare part importers (wholesalers) operate spare part delivery and repair workshop networks in the following following way. Kaha has a different strategy. It stays purely as an importer / wholeseller and it has not built its own repair workshop network. Instead it sells spare parts also to all the chains mentioned in the table. In addition to these chains, there are so called independent repair workshops who do not belong to any chains. In our database, there are currently more than 1000 independent workshops. These workshops typically buy their spare parts from Kaha. In addition to multi brand chains and independent repair workshops, there are brand-specific service workshops for each brand, in total more than 500 in Finland. Also these workshops are potential customers for AutoMopus. To conclude, the size of the potential market in Finland is at least 2600 repair workshops and at least 350 brick and mortar spare part shops plus dozens of web shops. In Sweden, there are over 10,000 repair workshops in total. The biggest chains are Autoexperten (established by KGK) and Mekonomen. There are 445 repair workshops and spare part dealers in the Autoexperten chain. In the Mekonomen chain, there are 463 workshops. Other chains include AD Bildelar, MECA, Hedin Bil, Meko Partner, OKQ8, BDS, Bosch Service and Speedy Bilservice, for example. Car density is still relatively low in the Baltic countries when compared to Western Europe, but the market is growing fast. The car aftermarket in Estonia is dominated by independent repair workshops, as they have 96% of the market. Bosch Car Service (having 12 outlets) is the only international workshop chain that operates in Estonia. The independent workshops do not have access to the services from the chain, which means that AutoMopus can bring significant added value. Competitors: We have found the following European companies, which offer web-based services for car drivers searching for several competitive offers for their car service: Drivelog.de, AutoButler.dk, Lasingoo.se, Caromba and AutoJerry. The basic idea in these services is to replace the traditional phone calls - which are used to get the best price for car service operations - with the filling of a web form. The business model is based on fixed monthly fees and variable provision based fees. 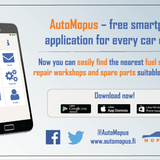 Customers: Consumers (car drivers) are our end-users, and can install and use AutoMopus for free. Our paying customers include repair workshops, car dealers and spare part delivery channel actors as well as other car-specific service providers. 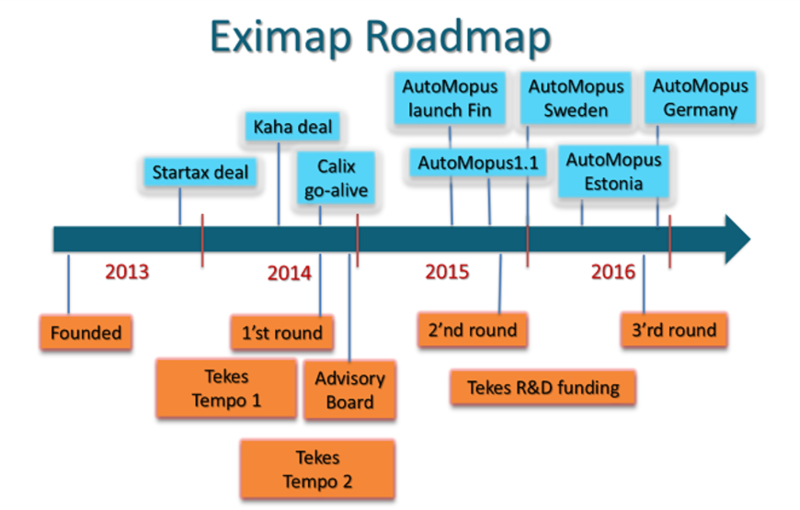 Eximap operates AutoMopus marketplace, which consists of consumers and service providers. An important role of this marketplace is the big data it utilizes, consisting of data on car profiles, maintenance history data and consumer behavior, needs and preferences. As a service operator, we recognize the challenge of getting enough of both consumers (car drivers) and paying customers. Our plan for consumer acquisition is to co-operate with a big media company, a carefully selected media relations company, and using the best social network and viral marketing approaches. We will gather new AutoMopus users when our customers - repair workshops – execute their first AutoMopus campaign for their own customers. Our plan for paying customer acquisition is based on co-operation with our key partners Kaha and KGK, who sell spare parts to numerous spare part dealers who sell them forward to repair workshops. Considering chained repair workshops, we have learned that although a workshop belongs to a chain, it still can make its decision independently. The chain offers some services and coordinated marketing efforts. We have started discussions with chains using both top-down and bottom-up approaches. For example, the bottom-up approach means that we have been discussing with individual repair workshops and spare part dealers in different chains such as AD, Fixus and Autofit. In addition and especially for branded service workshops, a direct sales approach is used. Eximap has signed agreements with leading spare part delivery channel actors in the Nordics such as Kaha (2nd biggest spare part wholesaler in Finland). During our co-operation projects, Eximap has gained insider information and deep understanding of the repair & spare part industry. More importantly, with our customers’ support, we can execute effective go-to-market with repair shops and spare part dealers, who buy their spare parts from wholesalers. 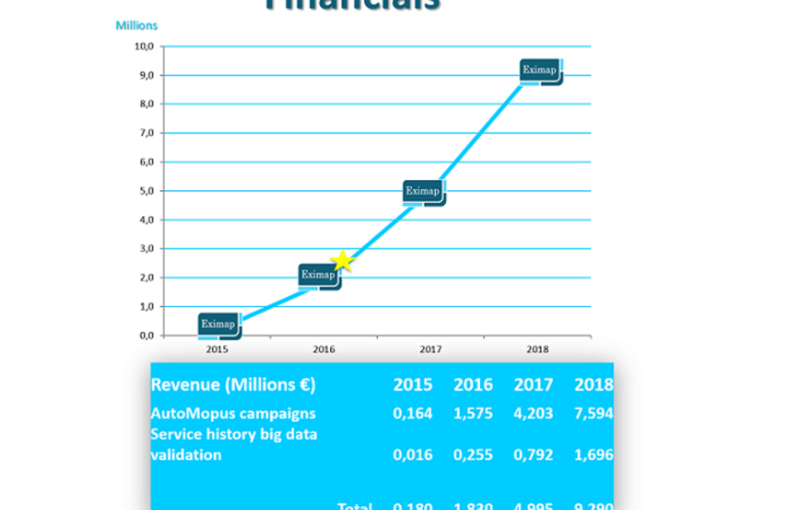 AutoMopus creates a personal & mobile marketplace, which gathers data on car profiles, maintenance history data and consumer behavior, needs and preferences. 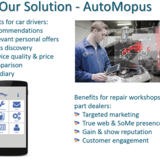 For repair workshops and spare part dealers AutoMopus offers a solution for targeted marketing, deals & offers, customer acquisition and for finding a correct spare part. Today, we already have 20 pilot repair workshops who will give us industry-specific expert opinions and feedback and will help us develop AutoMopus further. We have been planning first campaigns together with several pilot customers and identified needs for yearly inspection and windshield repair –campaigns, for example. AutoMopus works on all commonly used smartphones and tablets (Apple, Android, Lumia). AutoMopus offers a complete solution to fulfill car drivers' needs. 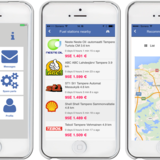 The application enables users to find the cheapest fuel prices based on the user’s location. 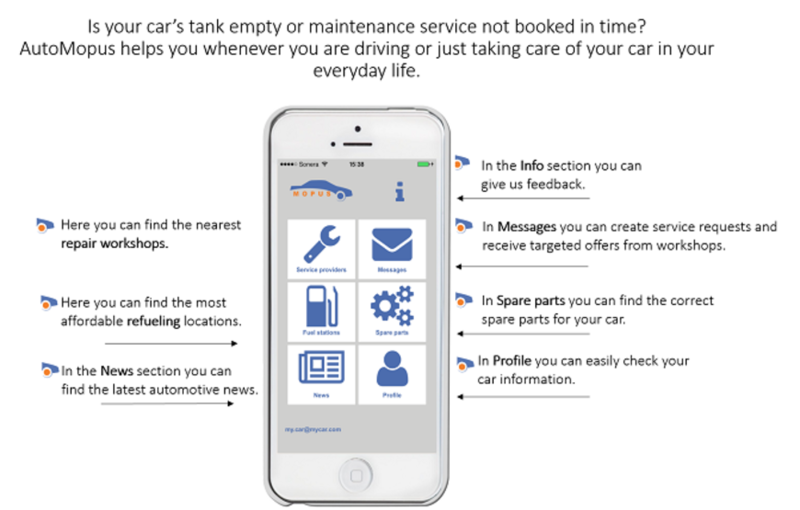 The app will also offer spare part search by combining the car register number and a technical database for spare parts. This combined search provides information on all correct and compatible spare parts for the user’s car. This information has not been commonly available. AutoMopus provides car drivers easy access to several spare part and accessory dealers, both brick and mortar and web shops. Finally, the big data that AutoMopus gathers enables data analysis, enrichment, and further commercialization. 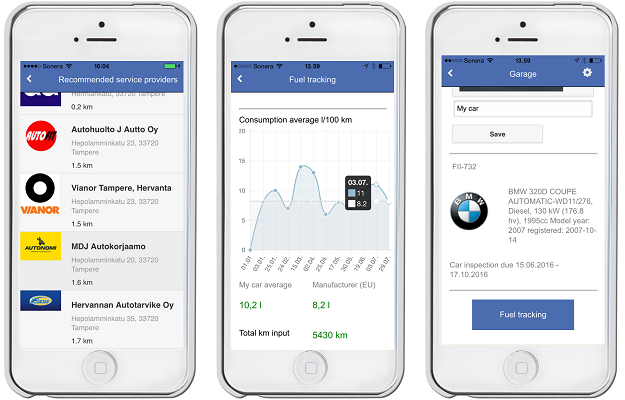 Business model: Consumers (car drivers) are our end-users, and can install and use AutoMopus for free. After getting a big enough AutoMopus community and feedback from them, some value-adding premium features including a fee can be considered. In the first phase, our paying customers include repair workshops and spare part delivery channel actors as well as other car-specific service providers. Later, after gathering and enriching data on car profiles including validated maintenance history, car dealers will also become our paying customers. The fixed registration fee includes access to the AutoMopus web portal. 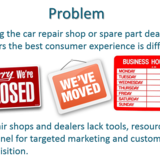 Spare part dealers and repair workshops pay for targeted marketing campaign messages. The marketing campaign includes versatile filtering options enabling very efficient targeting, e.g. the yearly inspection campaign is targeted at only those cars having the inspection time window open. The pricing model is simple: 1€ per message sent via AutoMopus. The message is delivered as a push message straight into users’ smartphones. AutoMopus is able to calculate exact statistics on which messages have been opened, which messages have turned into closed deals, and which messages have not been opened. AutoMopus is also able to remind the recipient if the message has not been opened. Our business model is very lucrative and highly scalable, since the incremental cost of adding a new customer (i.e., increasing the amount of campaign messages) is practically zero, and each additional message means growing revenue. Car dealers have indicated their willingness to pay for enriched car profile data including validated maintenance history. Enriched car profile data will help dealers to differentiate from each other. Car buyers also benefit from enriched data such as future maintenance/service costs. 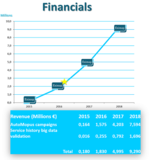 Financial projections: The key problem of car drivers - which Eximap’s AutoMopus is solving - is global: How to easily find the best repair workshop or car accessory for me and my car? The transparency is missing in all markets, which we have been considering while creating our global growth strategy. Our value proposition is also global, and works in our target markets without further modifications. 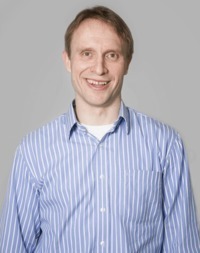 Market-specific optimization can be performed fast, when entering new target markets. This is the reason we believe in achieving our global growth targets in a fast schedule. The key global trend in car repair and spare part industry is constant change due to new technical solutions introduced in a fast pace. Servicing and repairing new cars requires investments in expensive testing equipment and tools (esp. software tools), which speeds up consolidation into larger units – traditional small repair workshops will disappear fast. Service workshops need new customers to pay back these new investments, which highlights the importance of customer acquisition, customer relationship development and highly dedicated targeted marketing. Another strongly growing global key trend in Internet business is the “aggregate broker” business model, examples of which include AirBnB and Über. The transactions - such as searches, reservations, purchasing of deals - performed by AutoMopus users will all create big data items, which enables a global business model based on data gathering, analyzing and enrichment. Dealers of second-hand cars, in particular, are very interested in the maintenance history of the cars they are selling, which Eximap can analyze and rate based on the data AutoMopus gathers. By 2020, Eximap’s target is to be a leading global service provider of targeted marketing solutions in car after sales markets. Eximap will also be a significant provider of enriched car maintenance history. The total number of yearly transactions in AutoMopus will reach the 10,000,000 milestone by 2020. 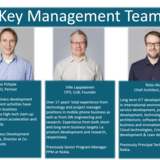 Our key management team provides extensive international corporate and entrepreneurial experience, with a global value-adding network.